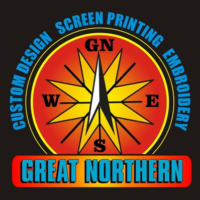 Great Northern Custom Screen Printing and Embroidery is a family owned and operated small business established in 1983 in beautiful Potsdam, New York. They believe in treating their customers how we ourselves would like to be treated. Their way of doing business can be described as old fashioned. They love meeting and speaking with people. Hiding on the internet and never seeing who we do work for isn’t their style.